Since it is #NationalDogDay I’d thought I’d share a pic of my dog Romeo. 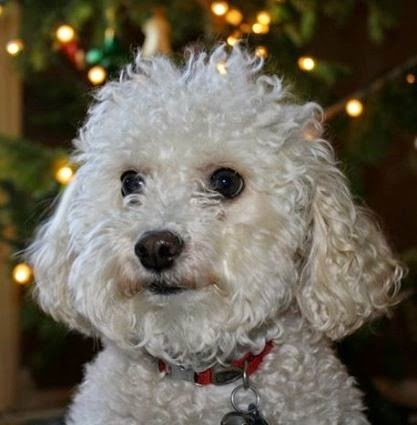 Romeo is a Toy Poodle rescue and the word “quirky” doesn’t even begin to describe him. I got Romeo when he was a little over 3 years old. I had left the crazy world of Los Angelesand found myself wanting a companion. I ventured down to the local shelter one afternoon and there he was…..a serious hot mess! Pacing back and forth in his small cage with a bandage tightly wrapped around his foot, eyes wild, hair mangled and urine stained. Romeo had spent the last 3years of his life in a cage, being used as a stud to breed for a puppy mill in Missouri. The puppy mill was raided and the dogs were rescued and various shelters offered to take the dogs and Romeo landed in the one I was at the night before. He was scared and I was told that he was attacked by a larger dog earlier that he was placed with, and that’s why his foot was bandaged. I asked one of the volunteers if I could see him. I was ushered back to a room and there I waited. Minutes later, the volunteer came in the room with Romeo. She left us alone and there I stood looking into these black panicked eyes…..I knew at that moment Romeo’s life and my life would forever be changed. After an interview, being warned that Romeo may never bond because of his traumatic past, and then being informed he wasn’t in the best health with lots of tooth decay, I still persisted that he was supposed to be with me. So papers were filled out, and I was told that I could come get Romeo the following morning. After leaving I seriously wondered what just happened….I was excited but also wondering if I had a clue what I was doing! I immediately went and got all the essentials needed and woke early the next morning in anticipation. Romeo was mine! As we left the rescue shelter the sunlight hit Romeo and he was freaked out! After spending years inside a pen, he was unfamiliar with this overwhelming light! I took him to a shaded area so he could go to the bathroom and set him on the grass…another shocker….Romeo didn’t know grass…he lifted his damaged paws in great curiosity not knowing what to do next. I soon realized that Romeo’s “normal” was re-leaving himself in his cage and that he had no concept of urinating away from his constant surroundings…..because he couldn’t. Shortly after this epiphany, I put him on a leash and tried to walk him up the stairs to my truck….Romeo didn’t know what the hell a leash was and stairs were a whole other story! At this moment I knew I had taken on a HUGE project! It was here, that Romeo and I shared the same feeling at the same time-panic! I am not going to lie, it has been a journey, and it definitely took awhile to convince Romeo that he could trust me, that I wouldn’t hurt him, and that I was going to care for him and most importantly love him. I have had Romeo now for 5.5 years. He was there in the room when my husband proposed, been with me through two pregnancies and we have bonded when I was told it most likely wouldn’t happen. He still has several oddities and I’ll never fully know what he went through those first years of his life but that doesn’t matter now….what matters now is that he is loved. Romeo, who behaves more like a cat, perched on the sofa for hours a day, has brought me so much love and he has taught me that consistent patience and love can heal the very broken hearted. I truly believe that God has a special place in heaven for dogs (I really do)….they love unconditionally and give us a picture of Gods unconditional love for us. I am eternally thankful that Romeo’s soul has met mine.